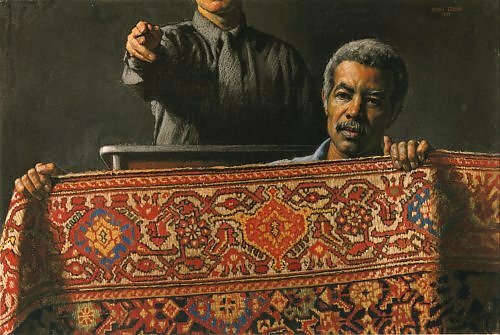 Bio: The Encyclopedia Britannica considers Daniel Greene the foremost pastelist in the United States and in 1983, the Pastel Society of America elected him to the Pastel Hall of Fame. In 2003, the Pastel Society of the West Coast named Mr. Greene a Pastel Laureate. In 1989, his work represented the United States at the first International Biennial of Pastel in San Quentin, France. In 1992, he was awarded American Artist's magazine's first Lifetime Achievement award in the category of oil painting and the Oil Painters of America Society named him to their Hall of Fame. In 1995, the American Society of Portrait Artists presented the John Singer Sargent award to Daniel Greene for lifelong dedication to the achievement of excellence in portraiture. He is married to fellow artist Wende Caporale. Subjects: Portraits, figures, subways, auctions, still life. Publications: Pastel. Watson Guptill, 1974. Still to be found (and sought) second hand. Style: Realistic, almost photorealism. The still life setups are idiosyncratic. Navigation: The most professional site of them all. Gallery: Classed by subject matter. Image view: Thumbnails open up to enlarged images in a series that one can go forward or backward. These may be downoaded to an image size up to 500x675, 57 KB. (He is inimitable). Demos: Not on the website. His videos are now on DVD.